Jim Prince, editor and publisher of the Madison County Journal, received the prestigious J. Oliver Emmerich Award for Editorial Excellence. It was the second time an editorial writer at the newspaper won the top honor from the Mississippi Press Association; the paper’s associate editor, Steven G. Watson, took the prize in 2009. Julie Cooper, editor of The Natchez Democrat, writes: “An expected 250-plus layoffs, the sale of a media company and three years of financial losses — if you followed the newspaper industry like I do, you might expect the national news that broke Tuesday to be about one of the larger newspaper companies in the country. Gary Andrews is retiring June 30 as publisher of The Yazoo Herald. A career newspaperman, he has been at the helm of the twice-weekly paper since 2002. He previously worked in Pontotoc, Aberdeen/Amory and Hattiesburg, among other locations. Jason Patterson, paper’s longtime managing editor, has been tapped to succeed him as publisher, Emmerich Newspapers has announced. The state’s two Republican candidates for lieutenant governor delivered on moderator Tim Kalich‘s tongue-in-cheek request Saturday to be “a little more feisty” than the four gubernatorial candidates who participated in a forum on Friday. Sen. Billy Hewes of Gulfport and state Treasurer Tate Reeves, a native of Rankin County, agreed on some issues, such as the need for continued insurance reform and early-childhood education. But an ongoing clash over who has been responsible for more debt simmered throughout most of the hour-and-a-half session, held at the Beau Rivage as part of the Mississippi Press Association’s 145th annual convention. 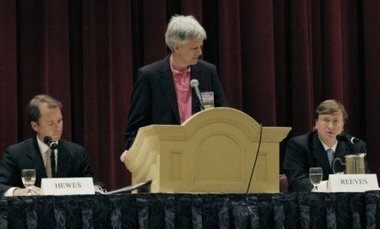 Gubernatorial candidates for Mississippi Governor made their case to editors and publishers Friday during a forum at the MPA Convention in Biloxi. The four appearing say they support an initiative on this November’s ballot to block state and local governments from taking private land for private economic development projects. 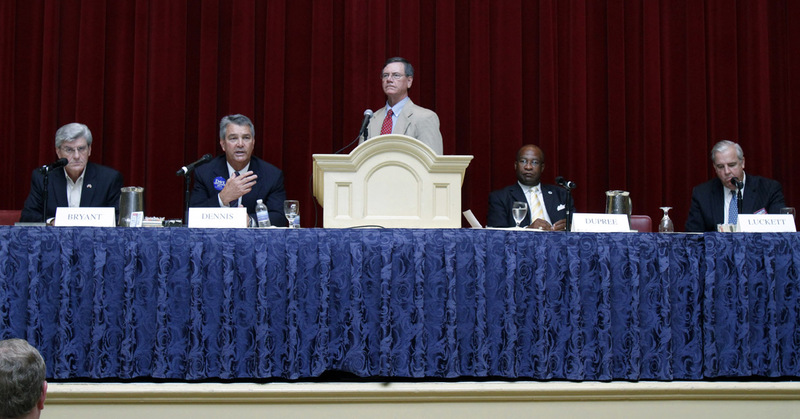 Republicans Phil Bryant and Dave Dennis and Democrats Johnny DuPree and Bill Luckett spoke about limiting eminent domain and other issues during the 75-minute forum. Expanding the Mississippi State Port of Gulfport is a long-term project that will create thousands of jobs and strengthen the state and national economies, Gov. Haley Barbour told newspaper editors and publishers Friday.